We have learned about angle measures since elementary grades. 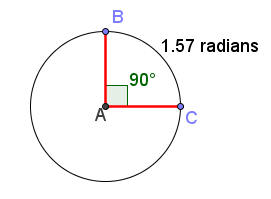 In Figure 1, we have a circle with center A, and radius length 1. Angle CAB measures 90 degrees and intercepting minor arc BC. This is also the same as saying that arc BC is subtending angle CAB. We have also learned that the entire rotation about the center of a circle is 360 degrees.